A new study finds that sharks living on reefs near areas populated by people have declined by between 90 and 97 percent compared to relatively pristine reefs where few or no people live. 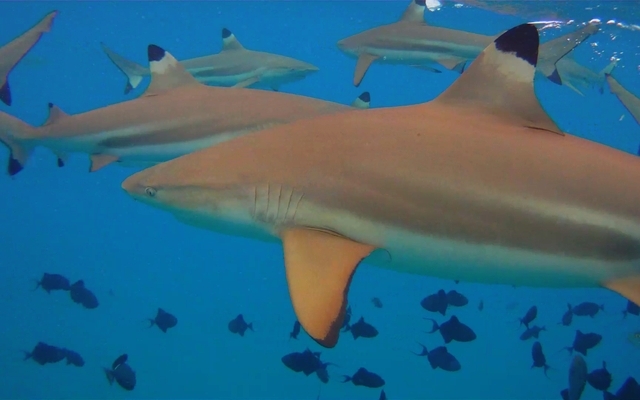 “We estimate that reef shark numbers have dropped substantially around populated islands, generally by more than 90 percent compared to those at the most untouched reefs,” says Marc Nadon, lead author of the study. The authors of the paper in early view at Conservation Biology deployed 1,607 towed-diver surveys—that’s where scientists are used as shark bait (kidding, sort of)—to count sharks at 46 reefs in the central-western Pacific Ocean. They combined those data with information on human population, habitat complexity, and reef area, as well as with satellite-derived measurements of sea surface temperature and oceanographic productivity. Densities of gray reef sharks (Carcharhinus amblyrhynchos), whitetip reef sharks (Triaenodon obesus), and other reef sharks increased substantially as human population decreased. Densities of reef sharks increased substantially as primary productivity and minimum sea surface temperature (which correlates to reef area) increased. 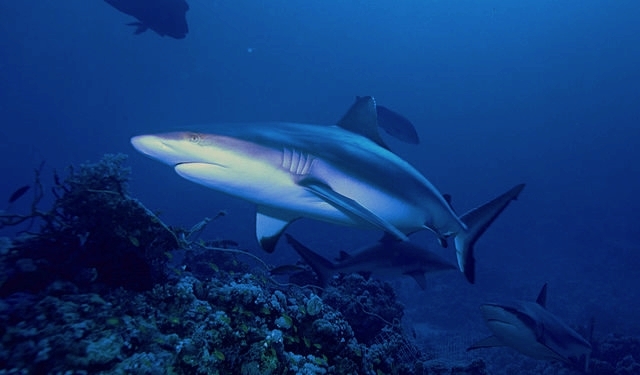 Simulated baseline densities of reef sharks under the absence of humans were 1.1–2.4 [per hectare] for the main Hawaiian Islands, 1.2–2.4 [per hectare] for inhabited islands of American Samoa, and 0.9–2.1 [per hectare] for inhabited islands in the Mariana Archipelago, which suggests that density of reef sharks has declined to 3–10% of baseline levels in these areas.